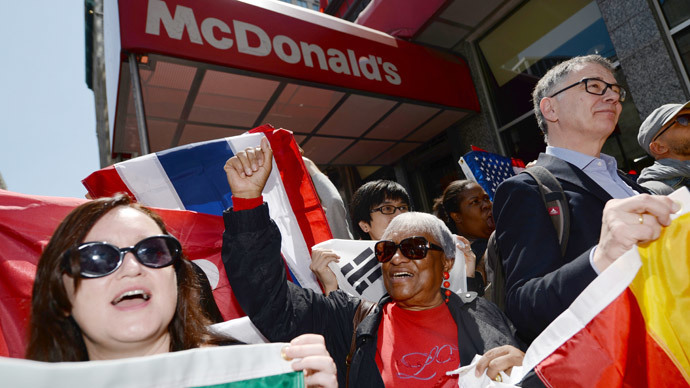 May 15th has been declared a global day of solidarity for fast food workers in 150 US cities and 33 countries who held rallies in an effort to boost the minimum wage to $15 per hour and other demands. While embracing globalization has led to massive profits for the fast food giants and their top executives, the phenomenon also has the power to unite hungry workers from around the world in their quest for a fair living wage and democratic representation. Spanning five continents, the global movement brought together thousands of employees from the industry’s heavy hitters who have not only revolutionized the way the world eats, but are now an integral part of the labor market: McDonalds, Burger King, Wendy’s and KFC. About 100 people gathered in Manhattan, with more expected later in the day. “We’re here fighting for our minimum wage - $15 an hour, respect in the workplace.” Sabrina Storey, a fast food worker at the rally, told RT’s Anastasia Churkina. Things have changed since the beginning of the Great Recession, protesters in the US said. Fast food workers are no longer teenagers trying to make an extra buck, but, in fact, adults who are struggling to feed their families while the giant corporations behind the industry make billions of dollars every year. “The majority of us fast food workers are the ages of 20 and up. And you gotta remember, most of us are single parents who have kids,” one striker said. The one day strike is the latest in a series of demonstrations in the last 18 months, which have targeted fast food outlets. 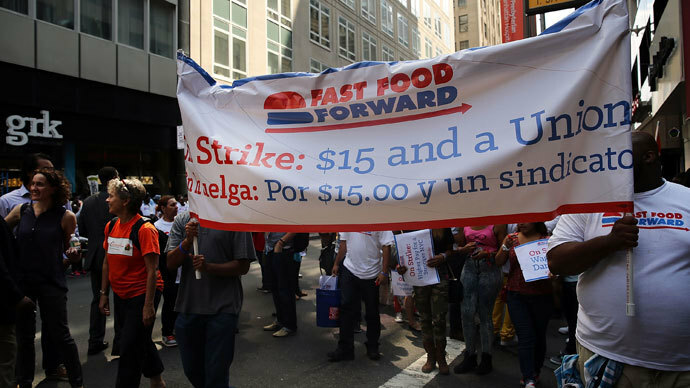 “We’re going to keep coming out, and we’re going to keep supporting this course until we get what we came out here for, which is for $15 [dollars an hour] and a union,” fast food worker Amber Graham said. Protesters said they’re going to keep coming out onto the street until their voices are heard by the companies they work for and by lawmakers, and until real change is implemented in the US. In the UK, workers were also demanding an end to zero-hours contracts, a type of employment clause used in Britain, where a worker has very few employment rights and is at the mercy of their employer as to the hours they work and their pay. They also seek to raise the minimum wage to £10 an hour. The minimum wage in the United Kingdom depends on a person’s age: Those under 18 earn a minimum of £3.72 an hour, while those aged 18 to 21 earn £5.03 and those 21 and over earn at least £6.31 an hour. Apprentices aged 16 to 18 and those aged 19 or over who are in their first year only earn £2.68 an hour. “[£10 an hour] is one of our demands, and it’s a demand we’re asking of the government, not just the McDonald’s, that you have a legal right to between £8.50 and £10 an hour,” a London protester told RT’s Sara Firth. The IUF represents 12 million workers in 126 countries, and Oswald believes the movement is only beginning to gain popularity. “This is just the beginning of an unprecedented international fast food worker movement — and this highly profitable global industry better take note," he said in a statement.. 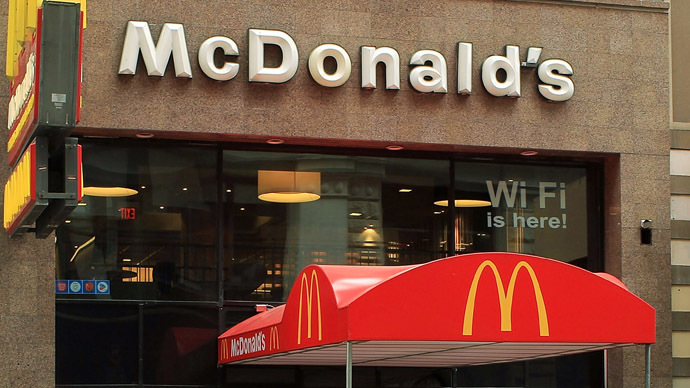 The global day of protest comes on the same day McDonald’s employees in California, Michigan, and New York filed class-action lawsuits against the hamburger chain – which serves an estimated 68 million customers daily in 119 countries - alleging the company is making employees work off the clock, refusing to pay overtime and even charging employees to have their uniforms cleaned. The study also provided the shocking data that people working in the fast-food industry are more likely to live in or near poverty. One in five families with a member holding a fast-food job has an income below the poverty line, and 43 percent have an income two times the federal poverty level or less. Presently, median hourly wages are stuck at $8.69 per hour, with just 13 percent of workers qualified to receive employment-related health benefits. Meanwhile, the families of more than half of all full-time fast food employees who work 40 or more hours per week are enrolled in public assistance programs. Following the devastating Global Recession that rolled across the planet in 2007, leading to millions of job losses, banker bailouts and harsh austerity measures, many people have come to rely on low-wage employment to keep food on the table. However, as the data shows, many individuals and families simply cannot afford to pay the bills with current salaries. Thursday’s strike is just the latest wave of worker discontent to hit the industry. Over the summer, employees from several fast-food companies, including Wendy’s and McDonald’s, repeated their demands for health benefits, a $15 minimum wage and unionization rights. 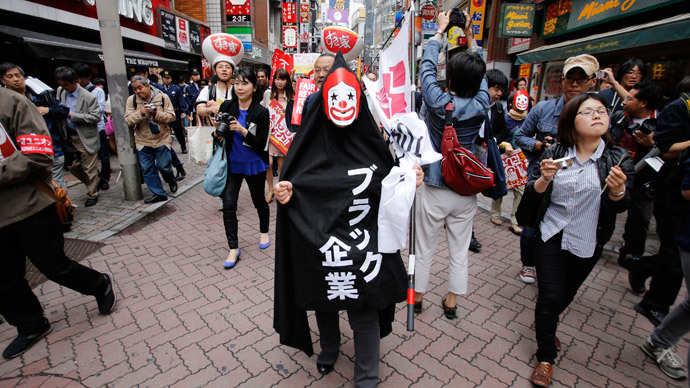 Meanwhile, efforts to expose the dark side of fast food industry are beginning to bear fruit. On May 1, Seattle Mayor Ed Murray declared that the city’s minimum wage would be increased to $15 per hour, becoming the highest in the country. The move came in response to a high-profile campaign by newly-elected Socialist Alternative council member Kshama Sawant, whose call for ‘$15 Now’ continues to reverberate in cities across the US. The federal minimum wage of $7.25 an hour was last raised in 2009. On February 12, President Obama, responding to heat in the fast food kitchen, agreed to raise the minimum wage for federal employees to $10.10 an hour. It remains to be seen if the president’s political maneuvering in what promises to be a hostile election year will force the fast food corporations to follow suit and give their workers an honest wage.